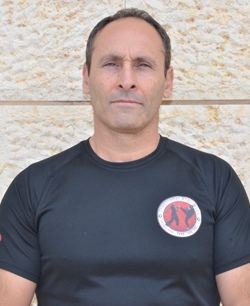 Erez Sharabi - head instructor and founder of TKM (Traditional Krav Maga). Dan 6 black belt (red-white belt). Erez has been training in Krav Maga since 1987 and was a senior student under Eli Avikzar R.I.P. - the principal student of the founder of Krav Maga, Imi Lichtenfeld (Sde-Or) R.I.P. He kept training under Eli for 17 years until his death. In 1992 he became a certified Krav Maga instructor. In 1993 he earned his Krav Maga black belt given to him by Eli. Erez had the honor of being one of the very few handpicked students to train in Eli's senior student training sessions. Shortly after receiving his black belt Erez opened a Krav Maga school in Even Yehuda, Israel, which became one of the biggest and best known schools in the country. Erez was appointed by Eli as a KAMI (Krav Magen Israeli) board member, the organization founded by Eli and which he was active in until he passed away. Dozens of black belts were certified under his training and supervision, including those students who went on to serve as civilian, military, security and law enforcement Krav Maga instructors. Erez continues to teach Krav Maga and hold seminars both in Israel and overseas. Erez's teaching style stays close to his roots with an emphasis on the principles of Krav Maga as taught by Imi and Eli. His teaching philosophy places a strong emphasis on universal humane values, such as dicipline, humility, the responsibility to help others and self-confidene, in order to create a non-violent and pleasant society. Additionaly, Erez is a graduate of Tel Aviv Law University, an attorney at law and a senior partner in the law firm "Sharabi, Naori and Sandler".